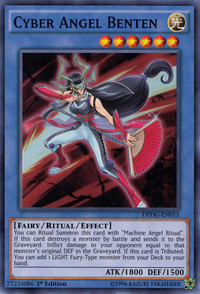 You can Ritual Summon this card with "Machine Angel Ritual". If this card destroys a monster by battle and sends it to the Graveyard: Inflict damage to your opponent equal to that monster's original DEF in the Graveyard. If this card is Tributed: You can add 1 LIGHT Fairy-Type monster from your Deck to your hand. Benten is one of the Seven deities in Japanese culture. She is the goddess of arts and wisdom. 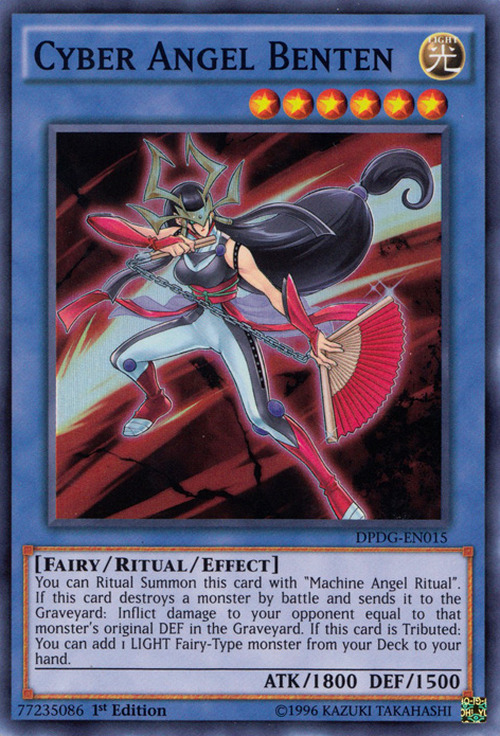 This card seems to be the Ritual counterpart of Elemental HERO Flame Wingman. The Spanish printed lore of this card does not follow said TCG branch's translation stylising as the word monster in LIGHT Fairy-Type monster has an M capital letter. This monster appears in the card artwork of Incarnated Machine Angel.